8 Commercial Real Estate & Properties in Lane Cove are listed in 2 categories. We have 5 Retail ShopsSale and 5 Industrial Warehouses Sale . Auction Shop & Restaurant Opposite Coles AUCTION Guide $840,000 to.. THE VILLAGE SHOPPING CENTRE Occupy or invest. Retail strata shop for sale; currently a long term successful Thai restaurant on an expired lease. Grab this opportunity to buy a 136sqm restaurant with extensive covered indoor/outdoor terrace areas, plus secure parking and storage, opposite Coles in growing Lane Cove Village. :: Shop area 136sqm :: Indoor/outdoor terrace :: Separate storage 7sqm :: Security car space 14sqm :: Fitted kitchen :: Total area on title 157sqm This extraordinary opportunity will not last, call for auction details and/or to register your interest today. Easy Access Self Storage Lot Call or text for immediat..
Industrial / Warehouse, Offices, Showrooms / Bulky Goods Grab this 34.5sqm self storage strata lot & solve your storage problems today. Easy access next to lift & loading area on the ground floor. Area of 34.5sqm with roof height of 3m = 103.6 cubic metres of storage. Selection of lots available from $65,000 & up to 38.6sqm in one line. Call or email for full details & pricing. Industrial / Warehouse, Offices, Showrooms / Bulky Goods Grab this 10.6sqm self storage strata lot & solve your storage problems today. Easy access next to lift & loading area on the ground floor. Area of 10.6sqm with roof height of 3m = 31.8 cubic metres of storage. Selection of lots available from $65,000 & up to 38.6sqm in one line. Call or email for full details & pricing. Industrial / Warehouse, Offices, Showrooms / Bulky Goods Grab this 38.6sqm self storage strata lot & solve your storage problems today. Easy access next to lift & loading area on the ground floor. Area of 38.6sqm with roof height of 3m = 115.8 cubic metres of storage. Selection of lots available from $65,000 & up to 38.6sqm in one line. Call or email for full details & pricing. 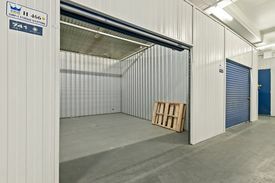 Industrial / Warehouse, Offices, Showrooms / Bulky Goods Grab this 13.4sqm self storage strata lot and solve your storage problems today. Easy access next to lift and loading area on the ground floor. Area of 13.4sqm with roof height of 3m = 40.2 cubic metres of storage. Selection of lots available from $65,000 and up to 38.6sqm in one line. Call or email for full details and pricing. Industrial / Warehouse, Offices, Showrooms / Bulky Goods Grab this 19.3sqm self storage strata lot & solve your storage problems today. Easy access next to lift & loading area on the ground floor. Area of 19.3sqm with roof height of 3m = 57.9 cubic metres of storage. Selection of lots available from $65,000 & up to 38.6sqm in one line. Call or email for full details & pricing.